Discover the highlights of Provence region on this private shore excursion from Toulon/La Seyne. Explore the world famous fishing port of Cassis, referred to as the little "Saint-Tropez" of Provence, famous for its stunning UNESCO-listed creeks, with white cliffs and turquoise waters. Meet your driver at the Port of Toulon/La Seyne and set off to Cassis, a charming village referred to as the little "Saint-Tropez" of Provence and enjoy some free time to explore the town, relax on the beach or board on a motor boat for a 45 minutes cruise in the main creeks (optional). 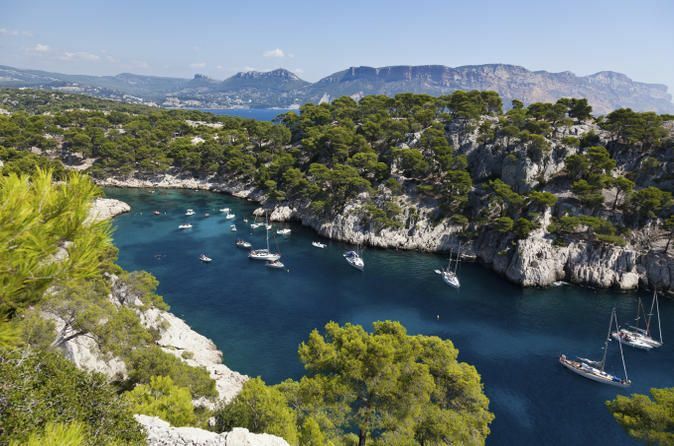 Cassis is famous worldwide for its "calanques", which are spectacular inlets enclosed with white sheer cliffs. After this, see Cap Canaille which forms an immense stone rampart. This mountain’s cliffs are one of the highest maritime cliffs in Europe. Visit the hill top village of La Cadière d'Azur and drive through the vineyards of Bandol, where you can stop at a prestigious and authentic winery and enjoy a wine cellar tour with a tasting of world renowned white, rosè and red wines. Next, reach the beautiful village of Sanary-sur-mer, in a typical Provencal picturesque setting. At the end of the tour, you will be driven back to Toulon/La Seyne port of cruise terminal.